Health Promotion supported the Breathe Easy Society (Charity No. 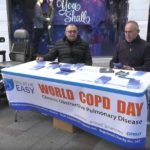 263) in a campaign marking World COPD Awareness Day. Chronic Obstructive Pulmonary Disease (COPD) is the name used to describe a number of lung conditions caused by the narrowing of the airways; conditions include emphysema, chronic bronchitis and chronic asthma. Living with COPD can be a challenge as difficulty breathing can make everyday tasks harder; washing, getting dressed, or walking short distances may require several breaks to allow rest and the chance to “catch your breath”. Yet in spite of the challenge, exercise is an important part of recovery and those with COPD require support and encouragement to complete daily activities. One of the greatest risk factors in developing COPD is smoking cigarettes; this is responsible for around 90% of all cases. Long-term exposure to pollution, toxic particles and gas. Genetics, for example having a close relative with the condition. Awareness is key to COPD prevention, and requires the elimination or reduction in exposure to triggers. Giving up, or never trying, cigarette smoke is important; similarly, avoiding passive smoking is proven to improve lung health. There is currently no cure for COPD, however the sooner treatment begins the lower the chance of severe lung damage. If you think you may have undiagnosed COPD contact your G.P. for an appointment as soon as you are able.